Providing quality legal representation and mediation services for clients throughout the state of Florida, with offices in Tallahassee and Jacksonville. 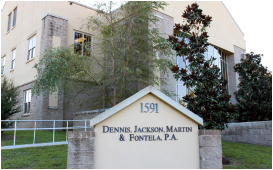 The firm’s attorneys are licensed to practice in all state courts in Florida, and are admitted to practice in all Florida federal district courts. We are devoted to the best interests of our clients, providing the highest quality legal services while remaining efficient, accessible, and responsive. The firm is “AV” rated by Martindale-Hubbell, the highest possible rating with respect to professional qualifications and ethics, and the firm maintains a reputation of being experienced, and effective advocates for our clients. Dennis, Jackson, Martin & Fontela, P.A.